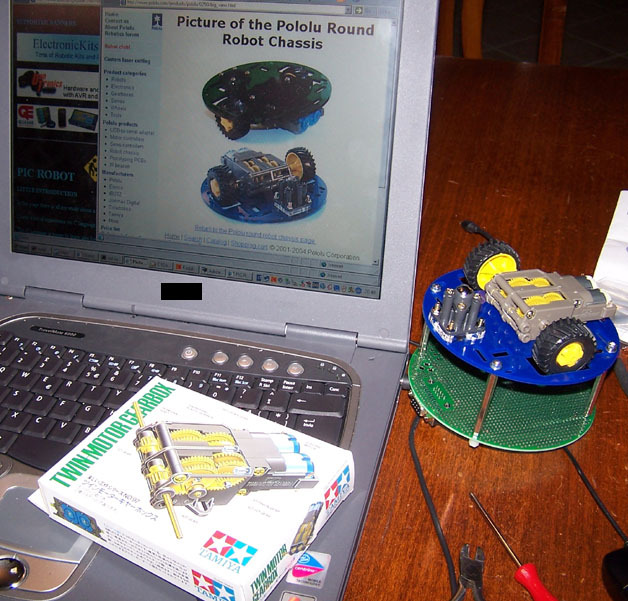 In this page there is all my study about a little robot driven by a pic microcontroller. I have a lot of experience on C language so my first idea has been use this language instead of the complex assembler. The C language is easier to learn also for the person without programming experience. The PIC FLASH used allow erasing and reprogramming of the MCU program memory. Reprogrammability offers a highly flexible solution to today's ever-changing market demands and can substantially reduce time to market. Users can program their systems late in the manufacturing process or update systems in the field. This allows easy code revisions, system parameteriza-tion or customer-specific options with no scrappage. Reprogrammability also reduces the design verification cycle. 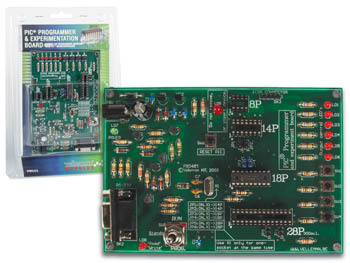 The manuals of this board are available on many languages and there is a chepper version in kit called K8048. 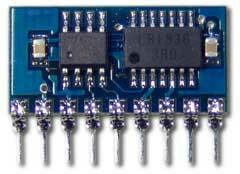 This board could be used to program and to make simple test with many PIC from 8 to 28 pins. The board coming with a PIC 16F627 installed. To transfert the program from the PC to the board it is necessary a serial port. My experienze with two different USB to serial converter has been negative. The samples programs are in assembler language and the demo2.asm allow to test any button and led in the VM111 board. select the demo2.asm file and click on Assemble button without change any options but checking in the listbox the processor 16F627. A file with HEX estention will be generated in the same directory of the source file. 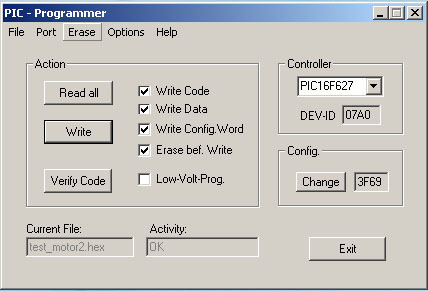 ,open the file with HEX estension, select the rigth Controller in the listbox to 16F627, move the switch on the board in the PROG. posistion and click on Write button. If all is gone fine an OK in the Activity box will be print. Now move the switch on the board in the RUN position and you should seen the LED game. Tolking with other DIY I have ear that the best programmer are the parallel version. To manage a more friendly code I have searched a C Compiler to start the experiment. 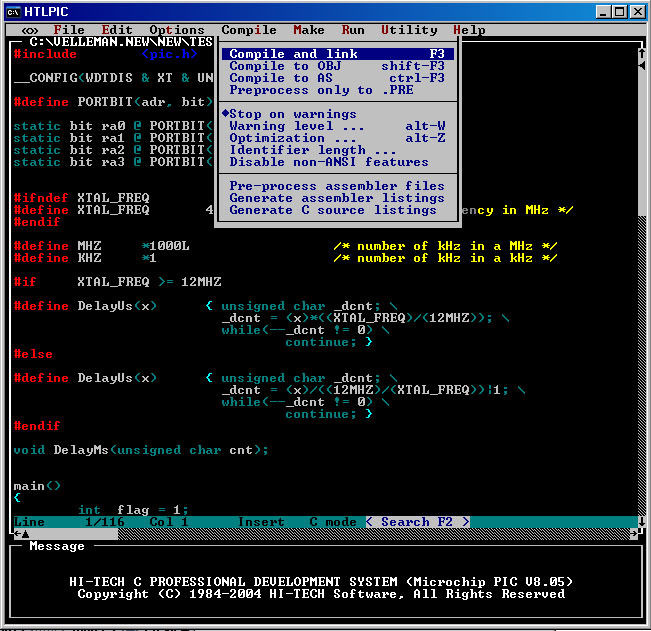 A freeware version of the C compiler could be found at HI-TEC Software in the Download / Demos & free software selectin PICC-LITE (Windows), also a Linux version is available. The develop environment HTLPIC include a simple editor with compile integration. You need just to open the source file with extension .C and select Compile / Compile and Link or F3. Remember to save the source after the modification with File / Save because the compilation does not save the source. A new windows ask for the microcontroller selection. Here leave as it is without changes. The compilation will start with a red window. Now we can start with a simple code to switch on a LED. Follows the schematic of parts the VM111 board relative to the connection from the PIC with 16 pins to the LED and SW (button). We can see that the LED6 is connected to the RB5 pin of PIC. 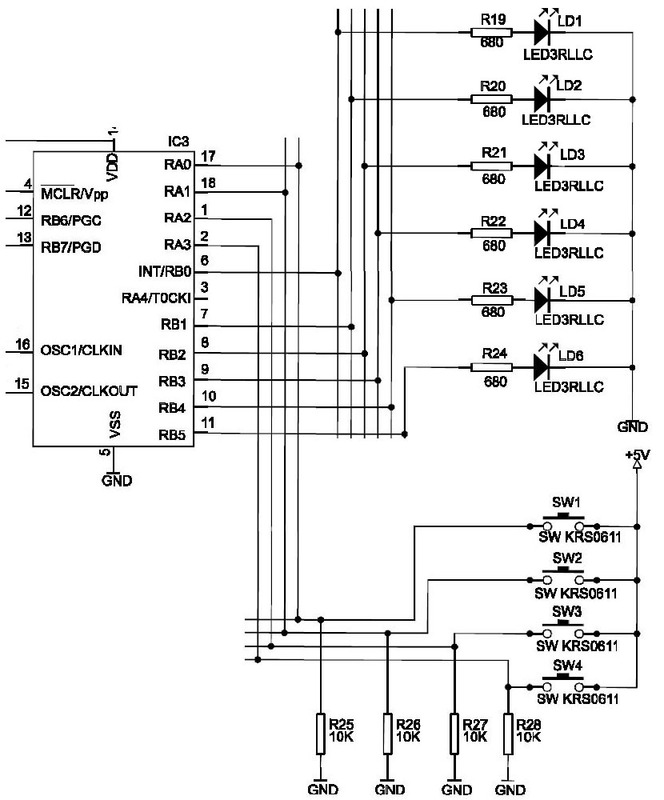 This schematic has been extract from the complete available in the manual of the K8048 board. Usually in the PIC the pins are configurable to do more functions so the same pin could be an input or an output or program input. This table show all the rgister that could change the use of the RB ports. The second line ofcourse switch on the led on the RB5 port (LED6). The __CONFIG specify the PIC processor configuration fuses and I have lost many time to search this because does not apper in many samples on internet. Without this line the PROGPIC2 program give the warning "No Config-World in File!" and if you go on writing this program this will not run. The uinique node to program a PIC without specify a __CONFIG line is deselect the checkbox Erase bef. Write and Write Config. Word to preserve a previous configuration and update only the code. The last parameter has been set to skip the problems found using the RB4 port. This port is a low voltage programming input pin when this is enable so cannot be used like output. There is the posibility to set only one bit per time of PORTB using RBx variables. To create a sequential led loop I have used the DelayMs() function given with the compiler like examples in the delay.c. The delay has been created leaving the microcontroller to do nothing. To get button state is possble use the RAx variables and the follwing table given in the PIC16F627 datasheet show the relative registers. Has been necessary disable the comparators on input pins RA0, RA1 and RA2 setting to 1 the first bits of the register CMCON. This code run but it have a little problem: the button press cannot be recognized until we are in the led sequential part of the code so to check the buttons functions you need to keep pressed the button until the led sequence is end. To skip the problem of this code you just need to change the DelayMs function inserting the button test in the loop. The button SW1 stop the sequential led loop, SW2 restart the sequentail led loop, SW3 switch on all the leds, SW4 switchoff all the led. The following is a simple example to check the timer and interrupt function of the PIC. in the italian articles on http://airlab.elet.polimi.it/document/pbe/italiano or www.tanzilli.com. To the left are visible the two different frequency source for the timer: the clock divide by 4 or the pin T0CK. Changing the value of the T0CS and PSA registers is possible change the flow as show below. Follows an easy example to switch on and switch off a led every second. Understand the Timer2 function is very easy using the following picture. The clock frequency divided by 4 pass to a prescaler with 3 possible set 1:1, 1:4 or 1:16 and it is compared with the PR2 register value. If the result of compare is an equal the frequency pass to a postscaler with all the value from 1:1 to 1:16. Here no explanation: code is code. 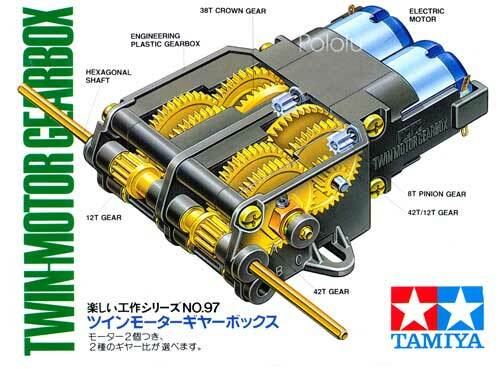 The Tamiya 70097 Twin-Motor Gearbox is a small (3in long) plastic gearbox. It contains two small DC motors that drive separate 3mm hexagonal output shafts. There are two ways to put the kit together: with a high-speed 58:1 gear ratio or with a slower 203:1 gear ratio. Either way, the motors provide plenty of power to drive any small robot. 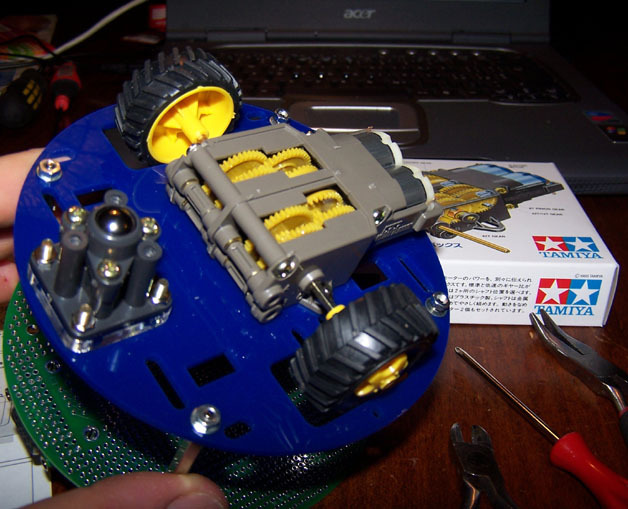 This motor unit togheter with the Tamiya 70144 Ball Caster and with the circular laser-cut plastic robot chassis produced by Pololu makes a great base for small mobile robot. 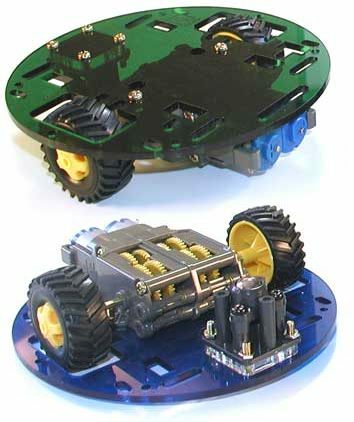 With a diameter of only five inches (slightly bigger than a CD), this acrylic chassis is ideal for building sturdy robots capable of navigating tight spaces. As shown below, the circular chassis has many holes and slots for mounting sensors, motors, and other hardware. 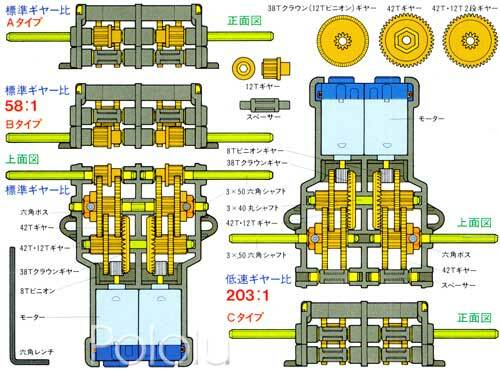 You can assemble the gearboxes to have a 58:1 or a 204:1 gear ratio but only the 204:1 (C) is valid for the integration with the Tamiya 70144 Ball Caster . If we want a speed regulator for the motors become necessary use a motor controller. The Pololu Micro Dual Serial Motor Controller can individually control two motors and set each motor to go forward or backward at any of 127 speeds. The connection with the microcontroller and with the two motors are very simple. In this following test I have connected both pin 1 and 3 of the motor controller to the power supply pack of the motors 3 x AA in series. I have used for this porpuse the Densi-Pak battery holders from RS Components (code 410-1444),.click here the size. The reset pin (5) has been connected to the pin 9 (RB3) of the PIC 16F627 and the input pin (4) to the pin 8 (RB2/TX) of the PIC. 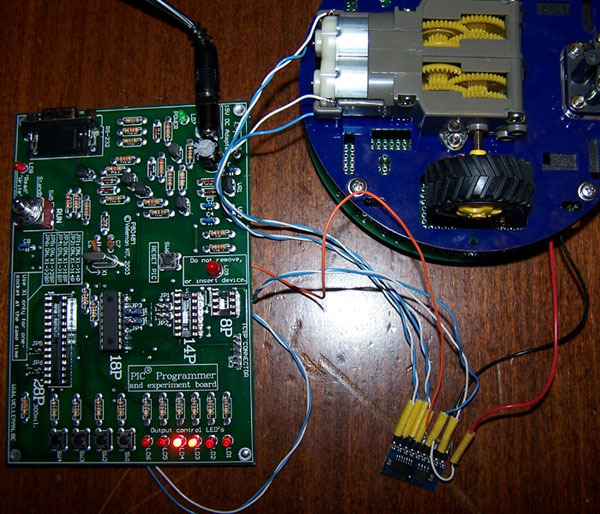 Follows the simple code to drive the two motors with this Micro Dual Serial Motor Controller. // Here I define some constant to create an easy to understand call to the motor() function. FERR = 0; // framing error bit ? // 4 MHz the value is 51. The following code will insert the foward/reserve test of the two motors. Excluding normal switches the first choice are the infrared distance measuring sensors. Ofcourse the GP2D15 is the most simple to use and it is possible to set the detection range at some value between 10cm and 24cm by making a simple modification to the sensor package (see http://www.acroname.com/robotics/info/ideas/adjust15/adjust15.html).